A 55,000-year-old human skull found in northern Israel confirms that humans were in the area at the time. Scientists have theorized that humans migrated from Africa to Europe between 40,000 to 60,000 years ago, and this skull is being hailed as key evidence in this theory.It is an important missing piece in human prehistory, study author Israel Hershkovitz told the Times of Israel, because it connects African and European hominids. 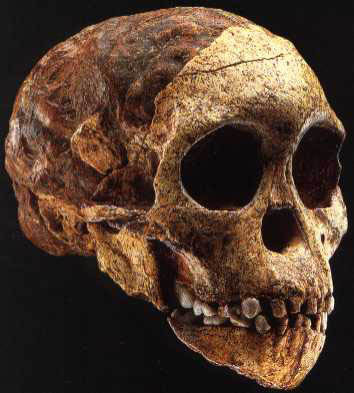 The skull was buried in the Manot Cave by a cave-in some 30,000 years ago. The cave was discovered when a bulldozer accidentally opened a hole in its ceiling in 2008. The Manot skull is the first to show that Neanderthals and modern humans inhabited the southern Levant region at the same time. Studies in recent years have shown human populations to contain a small percentage of Neanderthal DNA and have also placed an interbreeding at around 50,000 years ago. This date may be supported by the Manot skull. An ancient skull discovered in Israel could shed light on the migration of modern humans out of Africa some 60,000 years ago. This migration led to the colonization of the entire planet by our species, as well as the extinction of other human groups such as the Neanderthals. The skull from Manot Cave dates to 55,000 years ago and may be the closest we've got to finding one of the earliest migrants from Africa. Skull fractures can lead to an early death, even if the victims initially survived the injuries, according to a new study that looked at skulls from three Danish cemeteries with funeral plots dating from the 12th to the 17th centuries. This is the first time that researchers have used historical skulls to estimate the risk of early death among men who survived skull fractures, experts said. The study showed that these men were 6.2 times more likely to die an early death compared with men living during that time without skull fractures. Today, the risk of dying after getting a traumatic brain injury is about half that, likely because of improvements in modern medicine and social support, according to the researchers. This fossilized anomalocaridid is more than half a billion years old, but its neural structures - highlighted in blue using a digital filter - are surprisingly similar to those of certain invertebrates alive today. Expand One could be forgiven for mistaking anomalocaridids for creatures from another world. The spade-shaped predators, which lived in the seas during the Cambrian - the geological era stretching from 541 million to 485 million years ago - had eyes that protruded from stalks and a pair of giant appendages on the sides of their mouths. But three stunningly well-preserved fossils found in China now show that the anomalocaridid brain was wired much like that of modern creatures called velvet worms, or onychophorans. Advanced crafting of stone spearheads contributed to the development of new ways of human thinking and behaving. 200 000 years ago, small groups of people wandered across Africa, looking like us anatomically but not thinking the way we do today. Studies of fossils and the rate of mutations in DNA show that the human species to which we all belong - Homo sapiens sapiens - has existed for 200 000 years. But the archaeological research of recent years has shown that, even though the most ancient traces of modern humans are 200 000 years old, the development of modern cognitive behavior is probably much younger. For about 100 000 years, there were people who looked like us, but who acted on the basis of cognitive structures in which we would only partially recognise ourselves and which we do not define today as modern behavior. A 2,500-year-old human skull uncovered in England was less of a surprise than what was in it: the brain. The discovery of the yellowish, crinkly, shrunken brain prompted questions about how such a fragile organ could have survived so long and how frequently this strange type of preservation occurs. Except for the brain, all of the skull's soft tissue was gone when the skull was pulled from a muddy Iron Age pit where the University of York was planning to expand its Heslington East campus. University of Florida vertebrate paleontologist Jonathan Bloch shows the preserved skull of the 54-million-year-old primitive primate, Ignacius graybullianus, and the virtual mold of the brain made from the skull in this June 5, 2009, photo at Florida Museum of Natural History at the University of Florida. The mold, known as an endocast, was made using an ultra-high resolution X-ray CT scanner that took more than 1,200 cross-sectional images of the skull. Using a 54 million-year-old skull, researchers have constructed the first-ever virtual model of a primitive primate brain. To develop their model, the scientists took 1,200 ultra high resolutionX-rays of a well- preserved 1.5-inch-long skull from a mammal belonging to the ancient primate group Plesiadapiforms. The two dimensional X-rays were then stacked up and "stitched" together to form a 3-D model, Bloch said. While this imaging technique has been used to examine primate brains from more recent fossils, no one has used it to study so-called "stem primates," mammals that existed 65 million to 55 million years ago and gave rise to today's primates, until now. The skull used for this model is a "late-occurring" stem primate, a member of a group that survived from the Paleocene (65 million to 55 million years ago) into the early Eocene (55 million to 33 million years ago), Bloch said, adding: "But likely [it] is very similar to what stem-primates would have looked like during the Paleocene." The fossil was found in an iniopterygian, an extinct ancestor of modern ratfishes, which are distant relatives of sharks and rays. Maisey said the ancient fish, which swam in an ocean that once covered the midwestern U.S., would have fit in the palm of a human hand. The scans revealed the fish had a pea-size brain much smaller than the braincase itself. This is similar to modern sharks, rays, and chimaera fish, whose brain growth slows as they age, even as the rest of their bodies expand. The iniopterygian's brain has a large lobe for vision, and the skull has relatively large eye sockets. This suggests the fish was using its eyes as a major way to locate prey. In addition, the hearing-related section of the brain is flattened. This reflects the curious arrangement of the iniopterygian ear, which was optimized for side-to-side movement, but not up and down movement. The new research looked at four 3-dimensional braincases of iniopterygians found in shales from Kansas and Oklahoma. The specimens share several features with living ratfishes, which means that these skull features have been conserved in the group for the last 300 million years. Complete reconstructions of these skulls were made with a CAT scan and X-ray synchrotron microtomography, and the imaging of one skull showed a dense, symmetrical object sitting within the large braincase. This was the mineralized brain.